So you’re using Woothemes’ Sensei plugin to provide some type of courses to your visitors, and you’ve got the Modules component installed. Taken directly from the Woothemes Sensei Modules page, your actual display may be slightly different based on your theme. Great, what a handy thing to show your users. But what if you want to display this information somewhere else? Like, in a sidebar on the individual lesson pages? 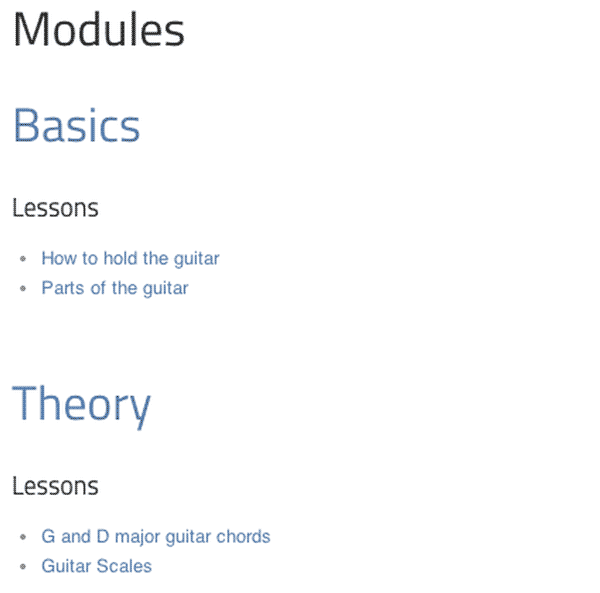 That could be handy if people are taking How to Hold a Guitar, as in the screenshot above, and want to know what other lessons are in the course. Here’s how to do it. I’ve added all of this to sidebar.php, but you could theoretically show it anywhere on a lesson page. This will export the list exactly as the current Woothemes Sensei default does, so all of the styling from that list should be matched up here. Of course, it doesn’t help that the default output uses HTML5 elements like <section> incorrectly (specifically the section.entry should just be a div, in my opinion), but it will get the job done for you! Why not just use the free Sensei Course Project widget? This puts all the modules and lessons in the sidebar and is color coded to show the lessons that were marked complete. Funny you mention that. I didn’t know about that widget and even asked Woo support how to do it on a lesson page. The support guy there basically said it needed custom coding, so I went ahead and built it, only to find the widget later. Nice! I wanted to have a little more functionality and the widget wasn’t working for me. Thanks for making life easier, dude. No problem, glad it was useful! Hi, wanted to have a lessons in sidebar with your code, but it is showing lessons in every module in wrong order. How can I fix it? This post is rather old, Ag and I wouldn’t quite know what was your own particular situation. Thanks for reply Nathan. I got theme Divi and Sensei plugin. Wanted to display lessons in sidebar added with plugin Superfly Menu. Everything is fine, but lessons order is wrong. They are in order by date. I want to display in order like in Sensei settings (lessons order). Can you tell me how can I do this? Sorry for my english, I’m still learning. Are you using my code or a plugin to display them? Still working at 2018, really thanks! Nice piece of code! How would you solve this if you change the module order in the WordPress backend? Sorry Elbert, it’s been so long since I worked with this plugin and don’t have access to any live setups of it at this point.